This is it! This is the big one… In a little over a month from now the entire world of watch collectors will be waiting for Rolex to unveil their Baselworld 2016 novelties. 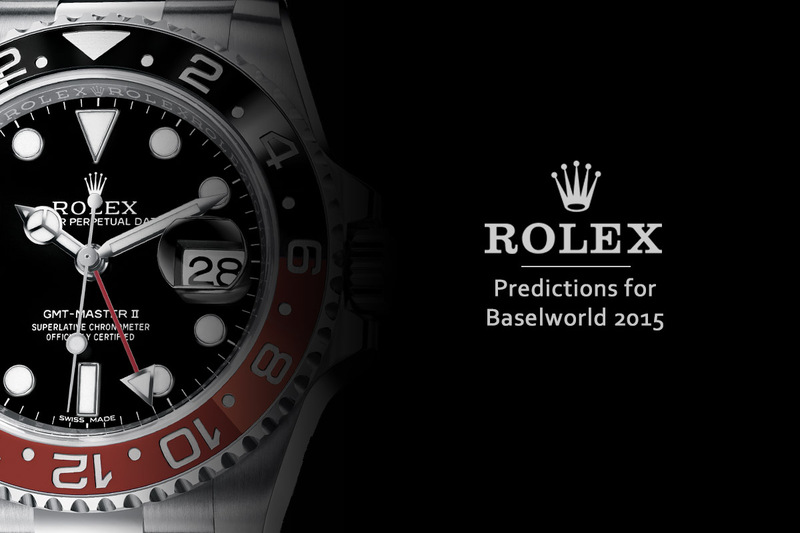 Just like we did last year, and in 2014, we’re going to show you our predictions: what will be the Rolex Baselworld 2016 novelties? It’s a mix of a bit of hope, our own expectations, data compiled from discussions at several watch forums and the right dosage of luck. And hopefully our Rolex 2016 predictions will be right. Let’s have a closer look at the watches that Rolex could potentially launch at Baselworld 2016 – or at least the novelties we hope to see from Rolex in 2016. Remember, these are predictions! 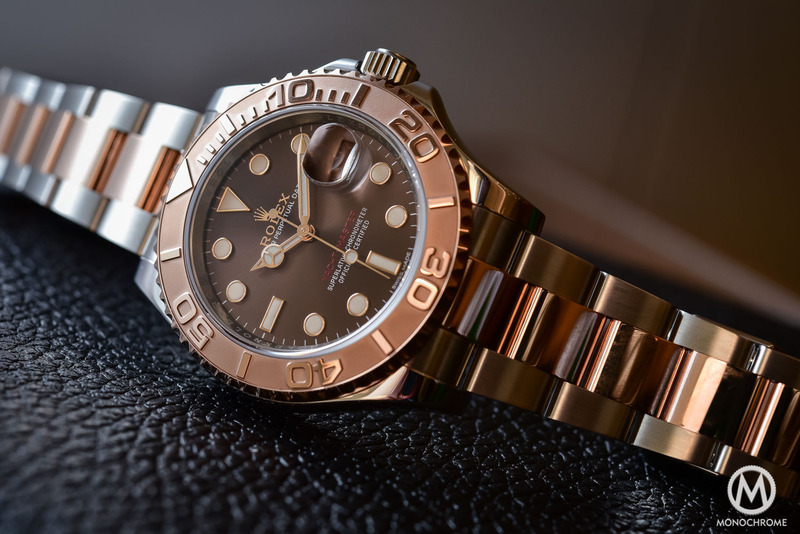 Last year, at Baselworld 2015, “The Crown” impressed us with an entirely new Rolex Day-Date 40, with redesigned, smaller and slimmer case, new dials and mainly, a completely new movement, the Calibre 3255 – with new barrel for a longer power reserve, the Chronergy escapement, a new variable-inertia balance wheel, an improved gear train and a nicer finish. 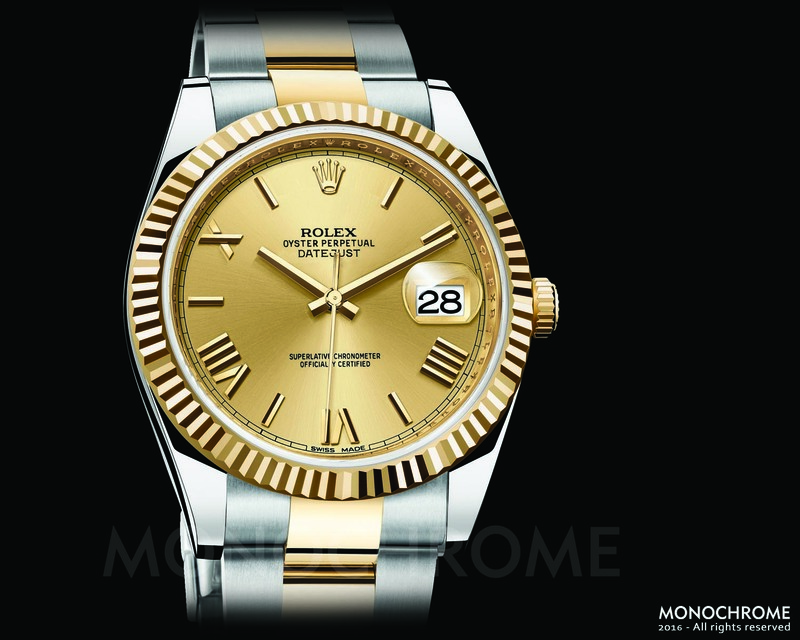 This Rolex Day-Date 40 was replacing the older Day-Date II, which had a 41mm case. 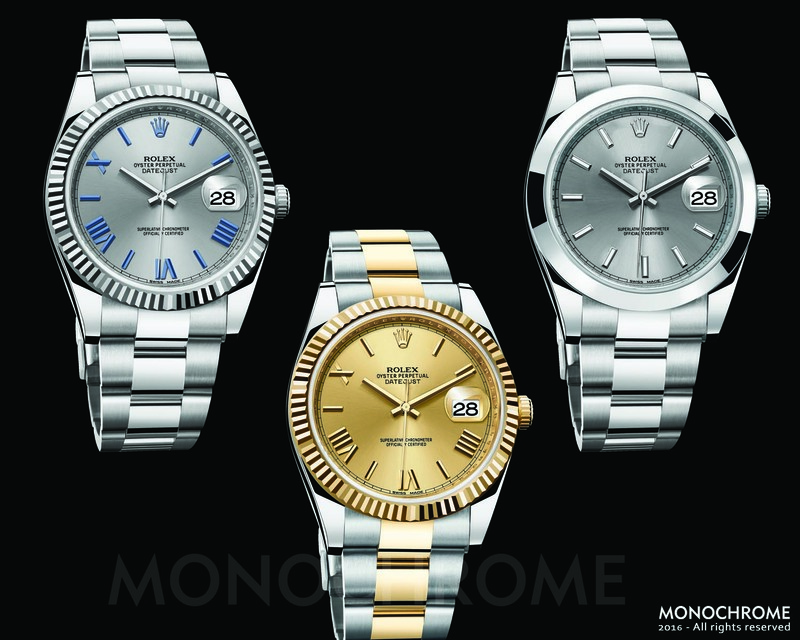 The new one is smaller, thinner, the case is slender and the dial and bezel are more refined. In order to give some coherence to the collection, we are hoping Rolex to apply the same concept on the DateJust, with the new 2016 Rolex DateJust 40, replacing the 41mm DateJust II. 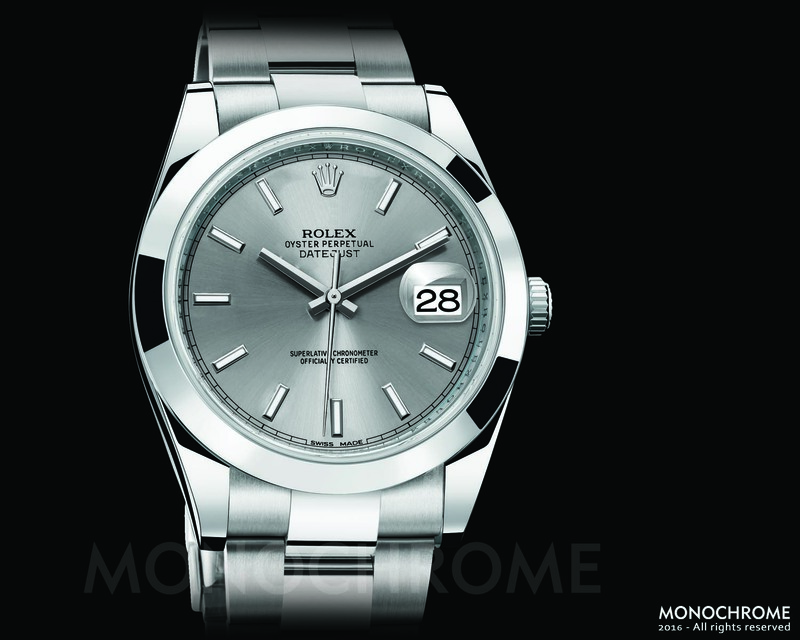 Besides the new design, we also expect Rolex to fit a simpler edition of the Calibre 3255 in this ‘imagined’ new Rolex DateJust 40 (a movement that could be called the Calibre 3235, to respect the Rolex nomenclature), without the day feature but still with the date in a window at 3 (with the iconic cyclops). Prices, in such configuration, could start around € 7,500 Euros for the stainless steel edition and go up to € 12,500 Euros for the two-tone edition. Please keep in mind… these are our prediction, no official new models, and no official prices. For years Rolex collectors have been waiting to see a new Cosmograph Daytona. We don’t don’t expect it to come any time soon, at least not in 2016, unfortunately. However, we do have reasons to think that Rolex will come with a new iteration of their iconic chronograph, at Baselworld 2016. 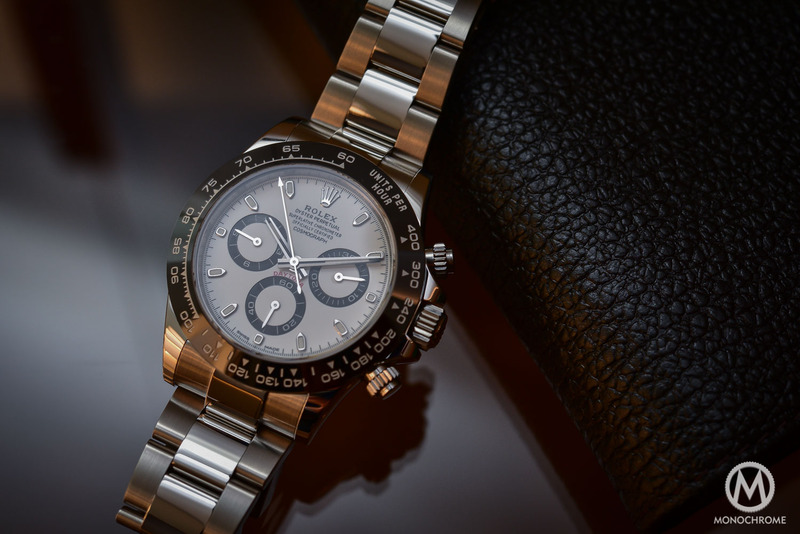 If you take a closer look at the Rolex website and the various editions of the Daytona, you’ll see that actually one is missing: the Daytona white gold on leather strap ref. 116519. It is absent of the catalogue for a few weeks now. 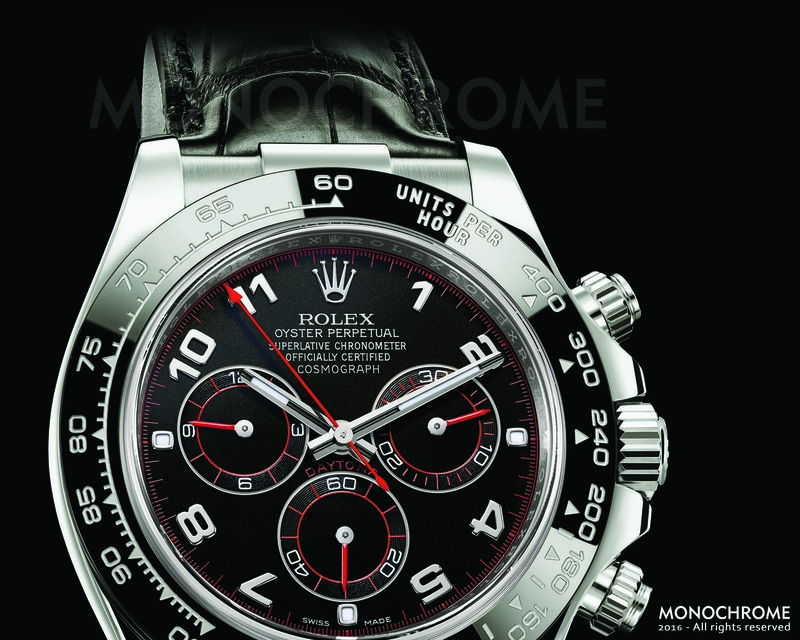 So what about a new version of this watch, a new 2016 Rolex Daytona White Gold, leather strap, black ceramic bezel – ref. 116519LN – just like the Everose gold edition. 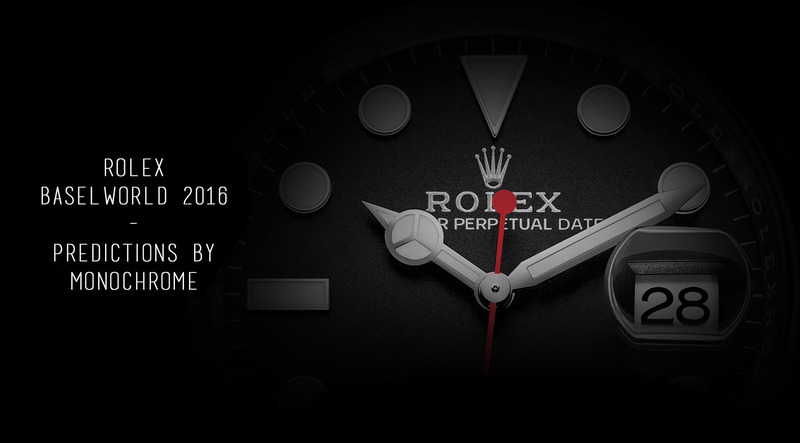 That’s why we expect that Rolex is going to introduce a new 18k white gold Daytona for Baselworld 2016. 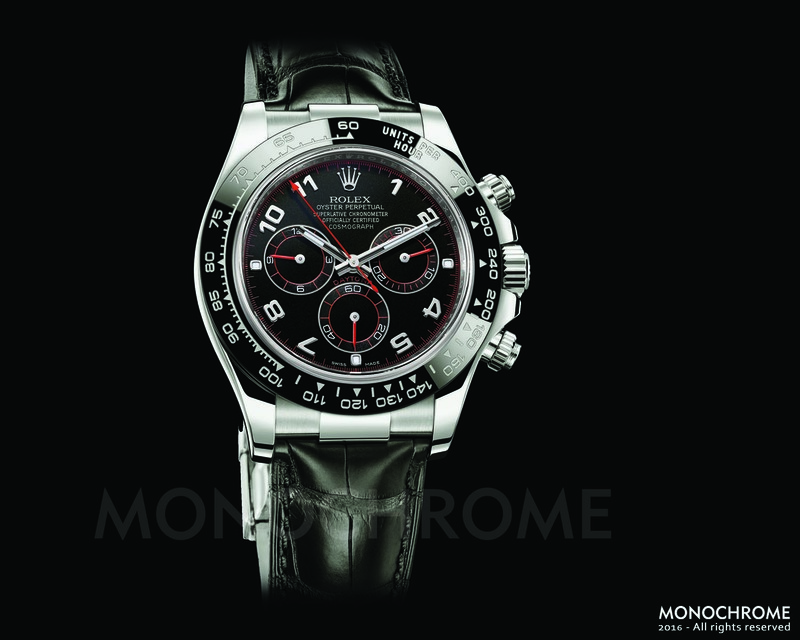 We imagined a full black dial and red accents (in fact one of the dials available on the Daytona white gold ref. 116509 on bracelet) for a pure racing look. 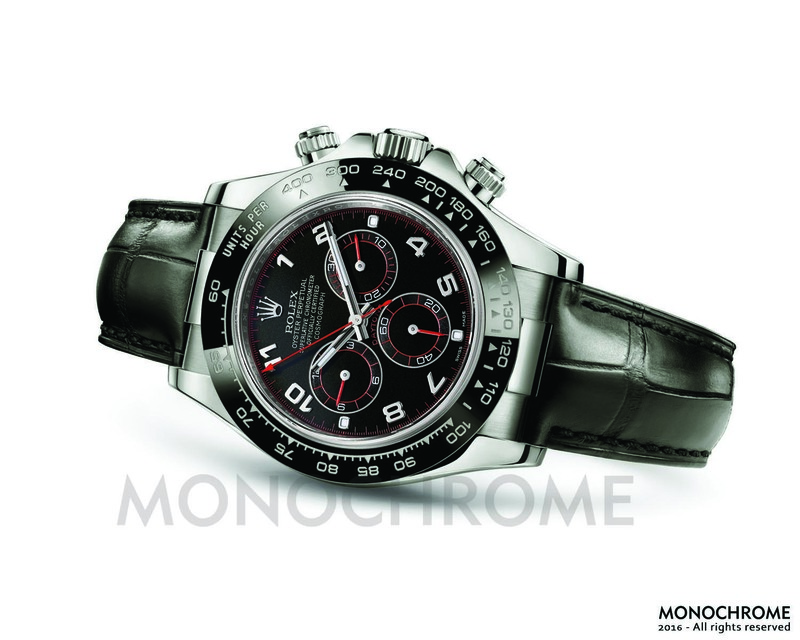 The 2016 Rolex Daytona White Gold on leather strap with black ceramic bezel – ref. 116519LN will share the same black ceramic bezel as the Everose gold edition, with of course white gold filled tachymeter scale. No other changes to expect: same 40mm case and same 4130 movement. Possible price: around € 26,500 Euros. 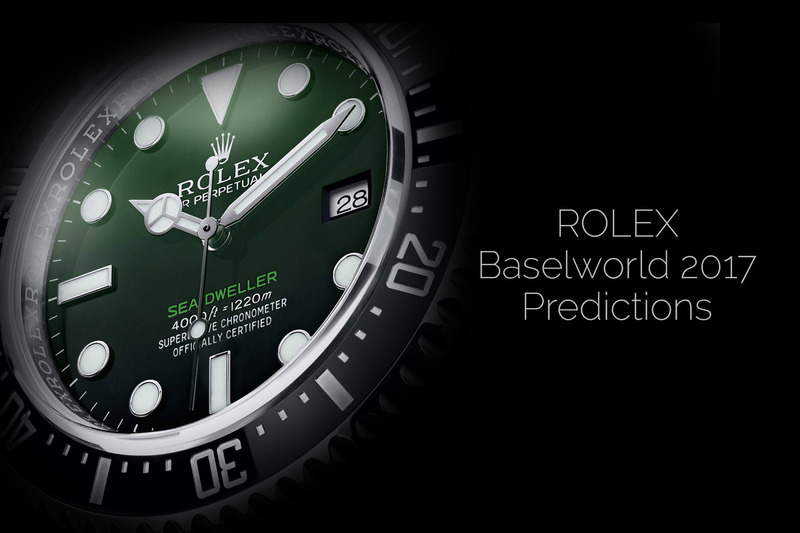 If this one could be the least possible of our Rolex 2016 Predictions, it is also a watch that is eagerly awaited by collectors. 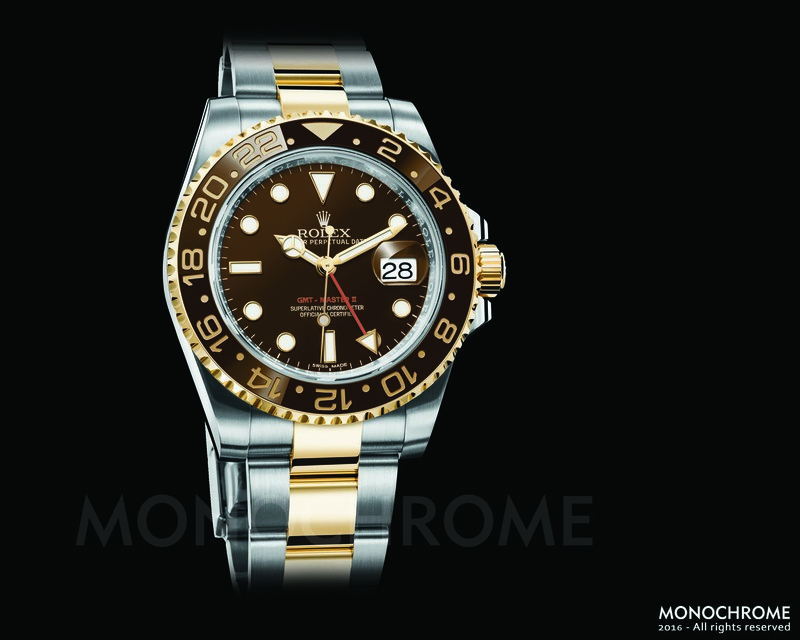 As we did with our 2015 predictions, we’re again predicting, or is it hoping for, the Rolex GMT-Master II “Root Beer”. The “Root Beer” is a nickname given by collectors, and refers to the ‘root beer’ brown dial and brown/yellow bezel. This will be a sort of vintage re-issue – just like the GMT-Master II Pepsi – with a two-tone case (stainless steel and yellow gold), a (root beer) brown dial with gold indexes and hands and finally, a brown ceramic bezel (something we’ve already seen in the Platinum Daytona), with numerals filled with yellow gold. Nothing new technically, just an interesting new iteration that could please vintage lovers. 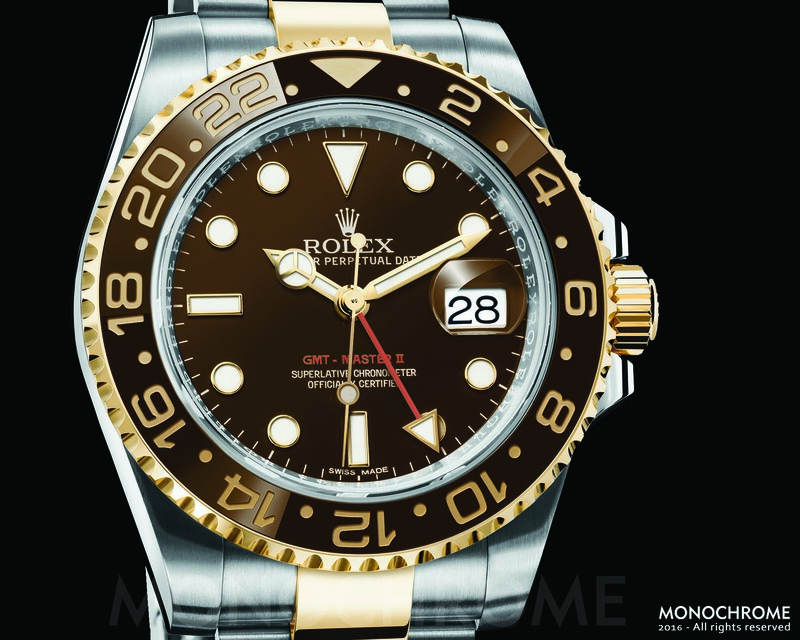 Our Rolex GMT-Master II Two Tone, with Root Beer dial and brown ceramic bezel Ref. 116713LM (for ‘lunette marron‘, brown bezel) could be one of the great surprises for Rolex at Baselworld 2016. 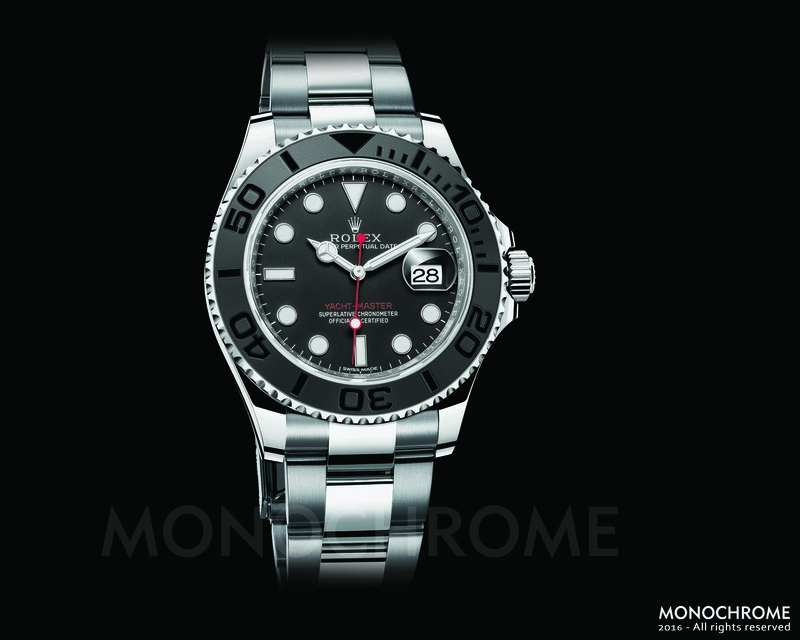 While we think the chance that Rolex to come with this GMT-Master II are very low, the crown could surprise us, and we wouldn’t mind! Approximate price in such configuration: € 13,000 Euros. In 2015, Rolex launched a new edition of the Oyster Perpetual, with a 39mm case and coloured dials. This year at Baselworld 2016, we expect Rolex to present a new Oyster Perpetual 39 ref. 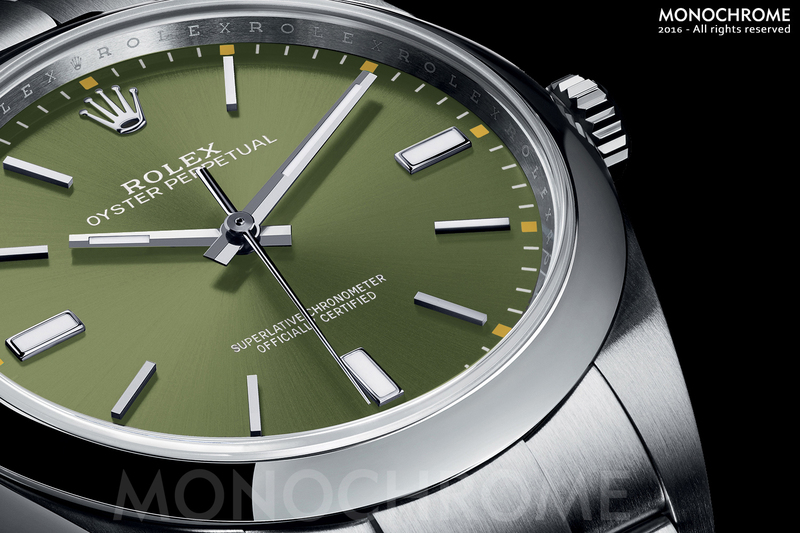 114300 with an Olive Green dial – for two reasons. 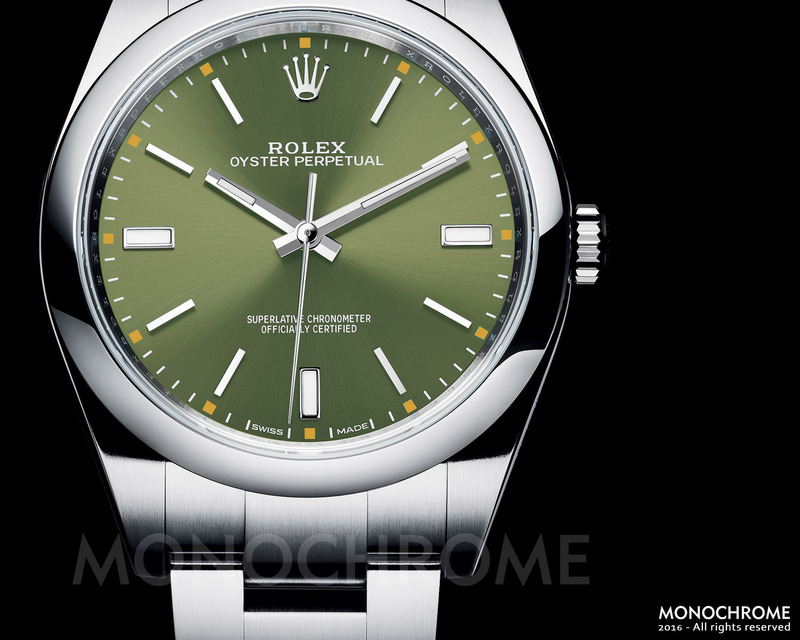 First, Green is THE colour of Rolex, and such a dial already exists in the 34mm Oyster Perpetual. Secondly, Monochrome’s Founder and Executive Editor, Frank Geelen, fell completely in love with this 34mm Olive green edition last year and he would love to see it in the more masculine 39mm case. So here it is. Rolex, with the Oyster Perpetual 39 ref. 114300, already played with coloured dials, as besides the traditional anthracite version, there’s also a Red Grape and a bright Blue edition. So it isn’t totally crazy to imagine such an Olive Green edition. And frankly, with the contrasting orange accents, it looks really great. In a few weeks we’ll know…. Possible price is probably similar to the other coloured models: € 5,200 Euros. After a first edition in 2015 – that we really love – we are now hoping that Rolex will present three more editions of the Rolex Yacht-Master 116655 at Baselworld 2016. These new version should again come with a matte black ceramic bezel, polished raised numerals and the new OysterFlex rubber bracelet. 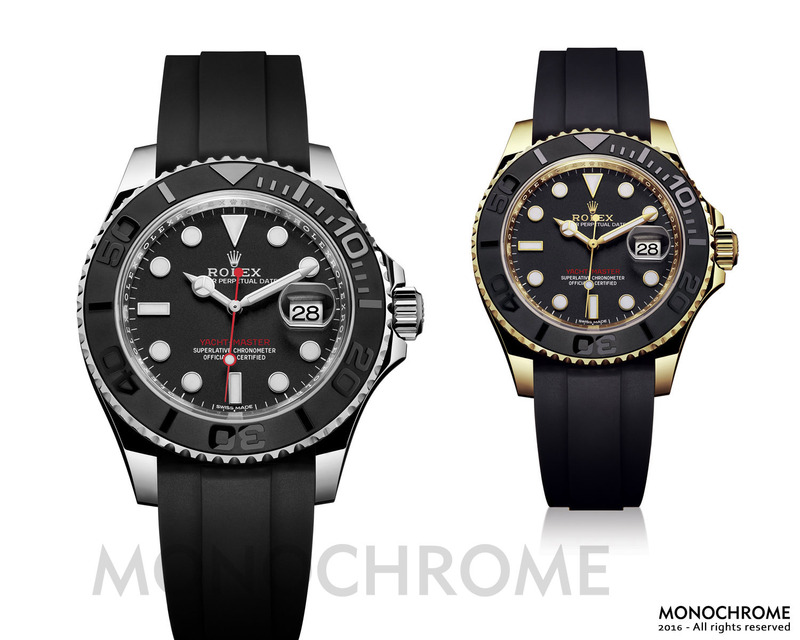 This version of the Rolex Yacht-Master seems to be very successful and it looks very good. However, for the moment, it is only available in Everose gold, as seen here. 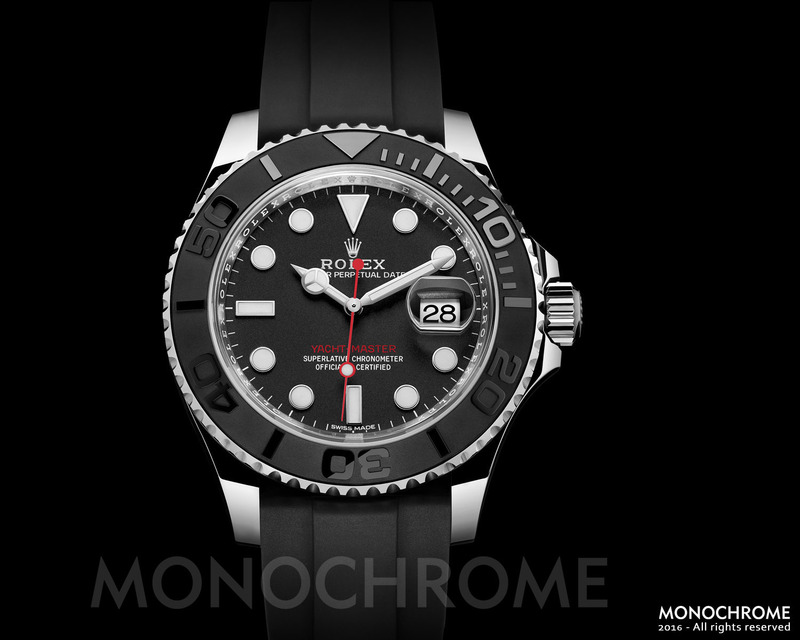 The addition of the black ceramic bezel was already changing the face of the Yacht-Master considerably. Moreover, in steel the Baselworld 2016 Rolex Yacht-Master 116655 would become even sexier, sportier and it will more affordable. An approximate price for the steel version could be € 9,000 Euros. 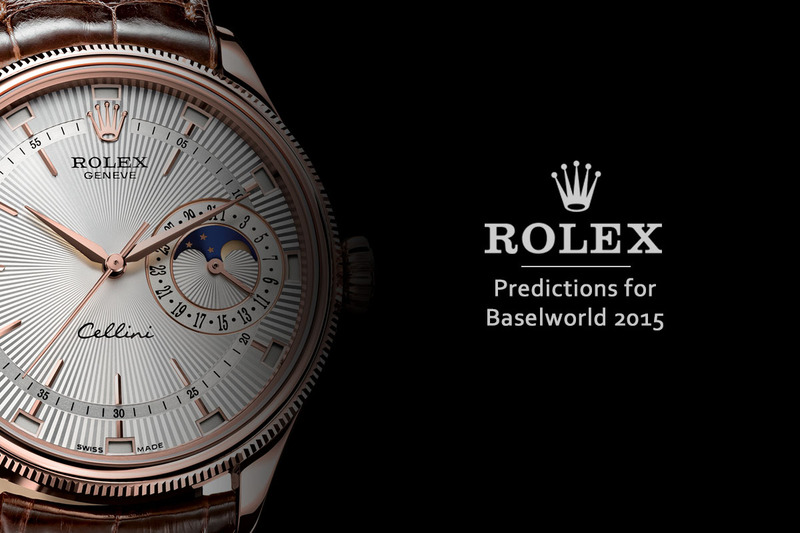 If you liked our Rolex Baselworld 2016 – Rolex Predictions 2016 article, we would love to hear your thoughts about our predictions. Please use the comment-box below. You can also share via our Facebook page, our Instagram account (@monochromewatch) and our Twitter page (@monochromewatch). I love all those predictions. Except for the root beer, which I’m fairly certain would be released as a full red gold GMT. Very nice predictions and illustration. The most likely one from these, is the white gold/ceramic/leather strap Daytona. As for the rest, they won’t happen in 2016 and some of them won’t happen at all. The DateJust 40 will happen, but not in 2016, not so close to the Day Date 40. Rolex takes time to “take back” a design strategy such as the case size increase to 41. So, the DateJust will be a 2017 – 2020 project. As for the incredible Everose Oysterflex Yacht Master from 2015, my guess is that nothing more will happen in 2016. And we will never see it in stainless steel. In the following years (again 2017 – 2020), we will probably have a yellow gold and / or white gold variation on the Oysterflex bracelet. Agree with Paul B. The YM with steel bracelet nearly made my slip out of my seat. The Daytona looks nice, but needs more changes than just a Cherachrom bezel. It needs changes to the case and the bezel, but most importantly it desperately needs new chrono pushers. I would buy that Daytona right now if it was available… Great job lads! 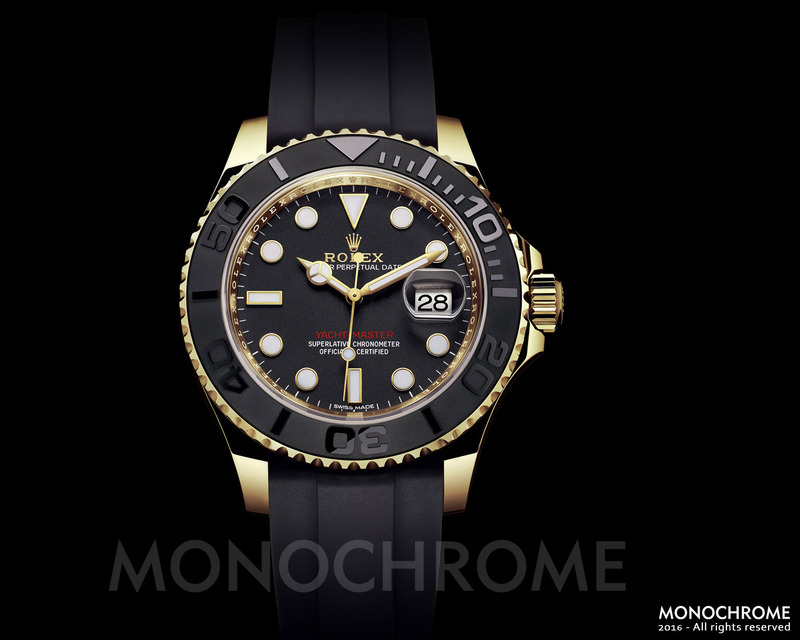 will rolex introduce a 42 mm GMT timemaster? 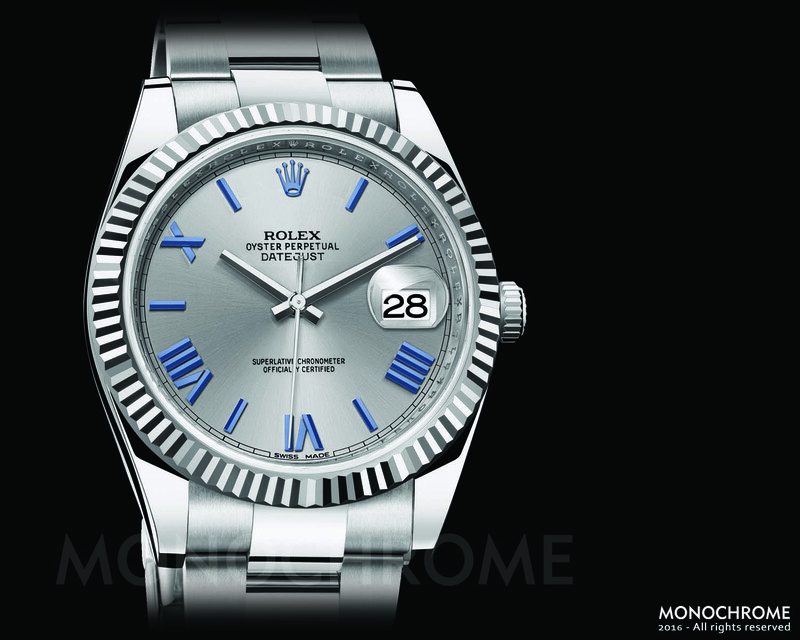 A new Datejust with a 39mm case, domed bezel case, all brushed links Oyster bracelet will be the right option. I had wanted to purchase the now discontinued Day Date II in rose gold with the black dial and diamond/ruby configuration and was disappointed that it is not available anymore. However, I was impressed with the new innovations on the Day Date 40mm and would consider waiting to buy one if in fact they eventually offer a black dial with the diamond/ruby option. 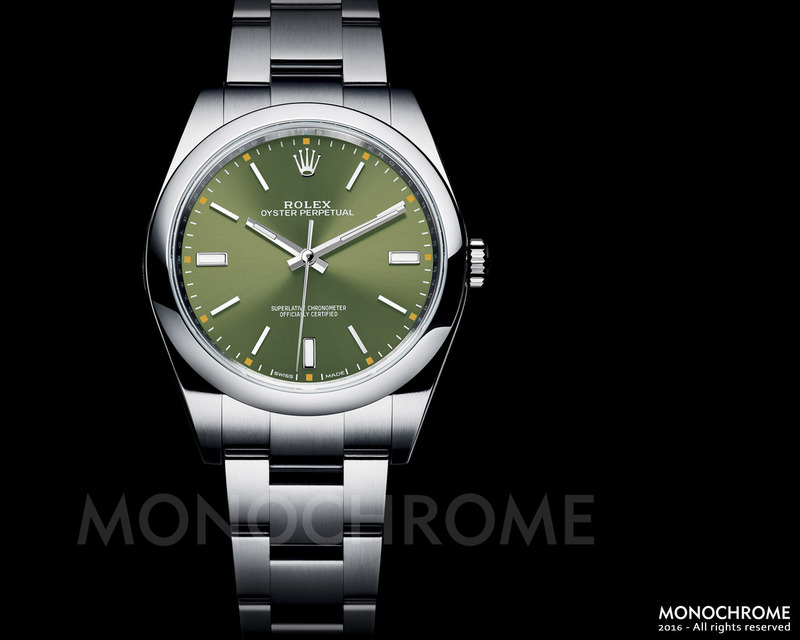 Any insights as to whether or not you believe that Rolex will again make this one of their offerings fo dial choices? Currently the selection for dials seems very limited and I am a bit frustrated that they did not manufacture enough variances with the new redesigned model. I admit I am a beginner myself in the beautiful world of watches. Today I went to try a few and I fell in love with the oyster perpetual in olive green and orange details. Just, alas! it is so small for my wrist- I read here they might launch for 2017 (?) a bigger version of this model. Ideally in 39mm. Is there any indiscretion in this direction? I would love to see it happening! I had a dream from so many years to have beautiful Rolex watch with blue dial and gold and steel bracelet four years ago ma wife gave me as birth day present . I am enjoying it beautifully . I simply love it . I have today that I own three Rolex watches I never wear. A gold pres w/diamond dial I actually bought for my father (who never wore it) and a stainless sub ( I do wear) and a 18kt/stainless sub as well as a white gold black face red hands Daytona. Unlike the person who commented on all the changes the daytona “needs”…if they change anything other than the options for them I’ll never buy another one. I already have stopped purchasing the new watches due to the slimmer bands. I don’t like the way they look. And I heard the OP and someone else comment on the smaller size case of the day/date. I ( obviously) prefer the larger case design. That’s one of the main reasons I own a IWC big pilot, for the case sz. But all that being said, to each his own. I understand personal preference and Rolex sure won’t go broke without my money, lol.